Looking for First Communion favors ideas? Our personalized apothecary mini jar favors are a perfect vessel for the trinket, keepsake or thingamabob that everyone seems to have. If you are more of a craft gifts giver, you can have fun personalizing these for your occasion and fill them with the candy or the craft of your choice. This glass container is an ideal storage jar that will last your guest a very very long time. And while they are storing their treasure, they will think of your party with fondness. Make these favors uniquely your own by selecting a color and design that suits you or your child. Each clear glass jar measures 1.75" x 3" and is in the classic apothecary shape with a hinged lid and a silver metal air tight locking gasket designed to keep the contents fresh. Fill with candies, potpourri, confetti, tea, coffee or any other fun filling! Both the front and the lid are perfectly fit for the application of the label of your choice. Available in an exceptional selection of colors, themes and customized titles, the labels are included in self sticking sheets for you to easily apply. 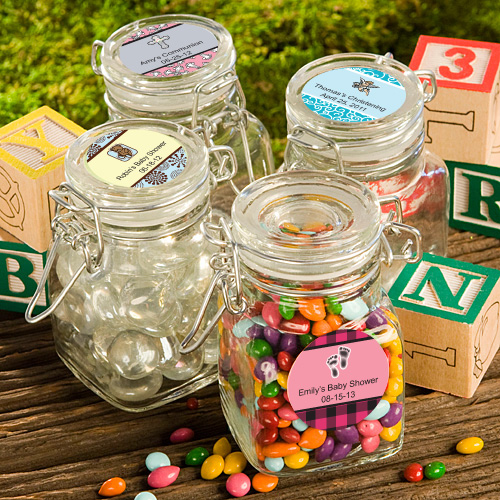 These jar favors come bulk packed in individual poly bags.